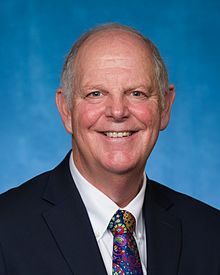 Thomas Charles O'Halleran (/oʊˈhælərən/; born January 24, 1946) is a member of the United States House of Representatives, representing Arizona's 1st congressional district. Beginning his political career as a Republican, he serves as a member of the Democratic Party. O'Halleran served with the Chicago Police Department from 1966 to 1975. He then became a member of the Chicago Board of Trade, operating his own futures trading business with a focus in futures contracts on 10-year U.S. Treasury notes. O'Halleran, then a Republican, served in the Arizona House of Representatives from 2001 to 2006. He then served in the Arizona State Senate, representing the 1st District from 2007 to 2009. In a 2008 primary election, he was unseated by Steve Pierce. After leaving the Arizona State Legislature, O'Halleran hosted a radio show on KAZM in Sedona. In 2014 he left the Republican Party, citing its policies on education, water, and child welfare as reasons for his resignation. He then ran for the 6th District State Senate seat as an Independent, losing by 3%. On August 6, 2015, O'Halleran announced his candidacy as a Democrat for Arizona's 1st congressional district. He explained his switch of party affiliation as a result of his positive attitude toward government, and, in particular, of his support for government regulations that would increase the use of wind and solar energy. In May 2016, O'Halleran was named to the Democratic Congressional Campaign Committee's Red to Blue list, indicating that his race was a priority for the group. On August 30, 2016, O'Halleran beat Miguel Olivas in the Democratic primary. He faced Republican Paul Babeu and Green Party candidate Ray Parrish in the general election on November 8, 2016. O'Halleran won, receiving 51% of the vote to Babeu's 44%. He is a member of the Blue Dog Coalition. O'Halleran ran unopposed in the 2018 Democratic primary. In the November 2018 general election he defeated Republican nominee Wendy Rogers with 54% of the vote. In March 2018, O'Halleran criticized the Trump Administration for seeking to cut funding for such agencies and programs as the Economic Development Administration, the Rural Business and Cooperative Service, the Manufacturing Extension Partnership, Community Development Block Grants, Rural Water and Wastewater Grants, Indian Community Development Block Grant, the Rural Economic Development Program, Essential Air Service, and Native American Housing Block Grants. After the Stoneman Douglas High School shooting in Parkland, Florida, O'Halleran, who had long supported expanded background checks but opposed an assault-weapon ban, suggested he might shift toward a stronger position on gun control. “At times you have to look at yourself in the mirror and do the right thing and say forget about the political consequences,” he said, but admitted he was concerned about those consequences. When President Donald Trump ordered a travel ban on visitors and refugees from seven predominantly Muslim nations in January 2017, O'Halleran said that the order “does not represent our nation's values” and that it violated the Constitution and "the bedrock ideals of our democracy." In April 2017, O'Halleran criticized Attorney General Jeff Sessions's tougher new guidelines on expelling illegal immigrants who belong to criminal gangs. “I have no problem with getting the felons out of the country,” O'Halleran said. "But some of these people that they're taking out of the country, they have children that are Americans, and they have not had a violent felony conviction. Here we are, taking mothers away from their children." O'Halleran was part of a group of Arizona Democrats who, in an August 2017 letter to President Trump, urged him not to pardon former Maricopa County chief Sheriff Joe Arpaio, who had been convicted in a federal court of racially profiling Latinos as part of border patrols. "It is imperative for a society to hold elected leaders to the highest level of accountability, and when they are convicted of crimes and lose the trust of the public, they must face their punishment,” said O'Halleran. “As a former law enforcement officer, Joe Arpaio's abuse and exploitation of his power to target vulnerable communities is beyond egregious and tarnishes the sworn duty of our brave officers across Arizona." O'Halleran and his wife, Pat, live in unincorporated Yavapai County (with a Sedona address), and have three grown children and four grandchildren. ^ Crawford, Jr., William (June 6, 1988). "'Open outcry' chaos part of trading art: A tradition that works". Chicago Tribune. p. D1. ^ a b "Meet Tom - Tom O'Halleran for Congress". www.tomohalleran.com. Retrieved 2016-07-30. ^ Bell, David (August 7, 2015). "Former state Rep. O'Halleran joins CD1 candidate field". Eastern Arizona Courier. Retrieved March 1, 2016. ^ "Tom O'Halleran". Ballotpedia. Retrieved March 1, 2016. ^ "O'Halleran announces candidacy in 1st Congressional District". Arizona Capitol Times. Associated Press. August 5, 2015. Retrieved 1 March 2016. ^ Sanders, Rebekah L. "Tom O'Halleran running for Congress as Democrat". azCentral. Retrieved 26 September 2018. ^ "Red to Blue - DCCC". Retrieved 2016-07-30. ^ Reagan, Kevin (August 3, 2016). "Bennett joins Babeu in pledging to term limits". Arizona City Independent. Retrieved 9 August 2016. ^ "Ray Parrish | azvoterguide.com". 2016.azvoterguide.com. Retrieved 2016-09-24. ^ "It's Republican Paul Babeu And Democrat Tom O'Halleran In Monstrous CD-1 Race". 31 August 2016. Retrieved 7 December 2016. ^ "Democrat Tom O'Halleran defeats Pinal County Sheriff Paul Babeu in CD-1". ABC 15. November 8, 2016. Retrieved 11 November 2016. ^ "Members". Blue dog coalition. Retrieved 26 October 2017. ^ "Tom O'Halleran". Ballotpedia. Retrieved 11 December 2018. ^ "Arizona Election Results: First House District". New York Times. Retrieved 11 December 2018. ^ "O'Halleran Chosen as Co-Chair of Blue Dog Coalition". Congressman Tom O´Halleran. 2018-11-27. Retrieved 2018-11-30. ^ Singleton, Laura. "O'Halleran concerned about rural programs on the Trump administration's chopping block". White Mountain Independent. Retrieved 26 September 2018. ^ BADE, RACHAEL; EVERETT, Burgess. "Could gun control flip the House to Democrats?". Politico. Retrieved 26 September 2018. ^ FARZAN, ANTONIA NOORI. "Here's Where Arizona's Top Elected Officials Stand on Trump's Border Wall". Phoenix New Times. Retrieved 23 September 2018. ^ Nintzel, Jim. "Congressman Raul Grijalva sues Trump administration over border wall plans". The Skinny - Tucson Weekly. Retrieved 27 September 2018. ^ Cross, Jim. "Arizona members of US Congress ask president not to pardon Arpaio". KTAR News. Retrieved 20 September 2018. ^ HANSEN, RONALD J.; WINGETT SANCHEZ, YVONNE. "Some in Arizona who sought Joe Arpaio's support mum on possible pardon". The Republic - az Central. Retrieved 27 September 2018.